At Enventys Partners, we create inventive, inspiring new products using an innovative approach we describe using the acronym BUILD. Below, we’ve taken a deeper look at each phase of our approach to product design and development to further explain the unique way we tackle a project and create a new product. During this phase of our approach to product development, we focus on creating a bespoke, custom strategy that will eventually influence both the aesthetic and function of your product. We begin with a strategy session where we work to blueprint where we are going and determine the path we expect the project to take. This phase of product development may involve creating a design brief, a technical strategy, a network structure strategy (if it’s an IoT project) or some combination thereof. With a strategy in place to serve as a roadmap for the project, we can now focus on furthering our research. Before we begin to design or engineer a product, we take the time to research the market, analyze existing products and discover valuable insights that will help us create a beautiful product. We use proven methodologies to uncover product and market insights that will guide our team through the rest of the process. This phase may include competitive product and market review, concept modeling, breadboarding, and more. This portion of each project is focused on design. Once we are adequately armed with data and industry knowledge, we design and engineer the foundation of the product. With a combination of design research, consumer analysis and human factors, we elevate form and function as we craft early models that lay the foundation for how the final product will look, function and feel. 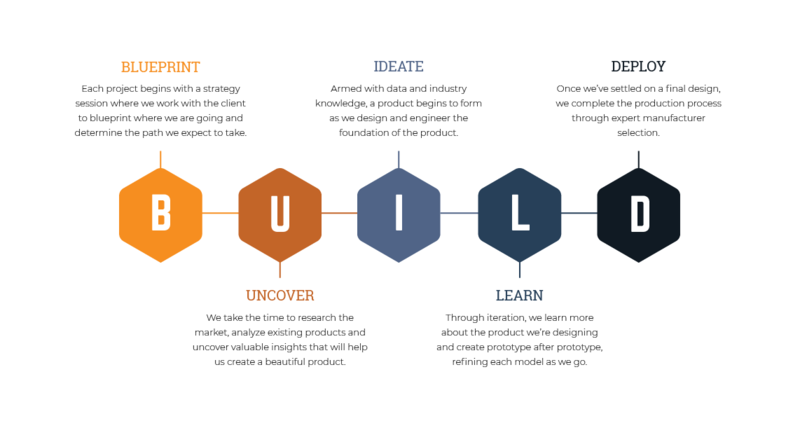 Our goal is to quickly find solutions and key insights in order to define the product. This phase of our product design and development process may involve form modeling, sketch ideation, style boards, UX/UI considerations, ergonomic studies and more. Eventually, we are ready to polish and perfect the initial versions of the product we’re creating. Our engineers and industrial designers use state-of-the-art equipment such as laser cutters, water jets, Computer Numerical Controlled (CNC) mills and 3D printers to make beautiful, functional prototypes. Through this iteration, we learn more about the product we’re designing and create prototype after prototype, refining each model as we go. This phase of our product development process may involve engineering, prototyping, printed circuit board (PCB) design, firmware development and more. Once we’ve settled on a final design, we focus on completing the production process, assisting with expert vendor selection and finalizing logistics. To help make this possible, our team relies heavily on our office in Taichung, Taiwan that manages sourcing in Asia, plus strong relationships with trading companies in Hong Kong, and long-standing relationships in China, Taiwan and Vietnam, as well as a network of contract manufacturers in North and Central America. This phase of the process typically involves design for manufacturing and assembly, bill of materials (BOM) optimization, factory selection, manufacturing and shipping. By this point, a new product is ready to go into the hands of consumers. However, at Enventys Partners, we don’t stop there. In addition to a full-service product development team, we have a large team of marketers who are experts at launching new products and brands online. Whether through crowdfunding on Kickstarter or Indiegogo or more traditional ecommerce marketing and pre-sale campaigns, we employ some of the most experienced product launch experts on the planet. To learn more about how Enventys Partners can help you BUILD and launch your next project, get in touch today and request a quote.